Happy Monday, and it's almost the end of the month! I hope everyone enjoyed their Easter weekend. Ours was very quiet and super relaxing. I'm so excited to host this link-up again this month. 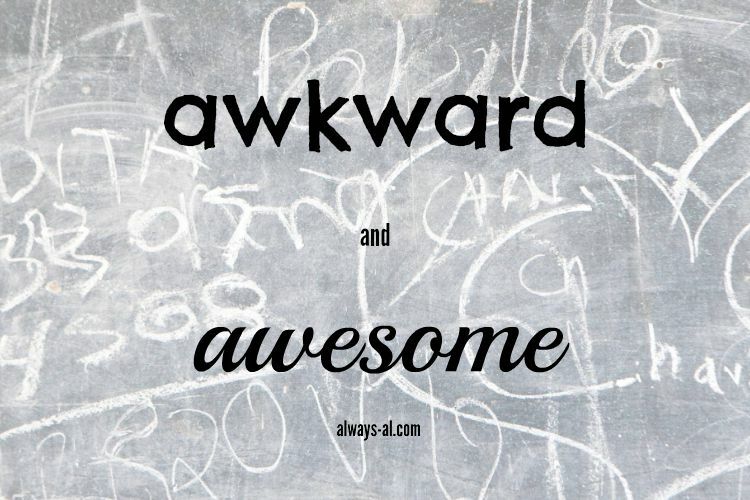 I loved reading everyone's awkward and awesome things, and I can't wait to read them again this month. I really need to start keeping an ongoing list of these. I always wait until the last minute to think of them and it always is stuff from the end of the month. Let's see if I can fix that for next month! -Yesterday I tried to make some Italian Easter Bread. I've baked this a couple of times over the years, but for some reason I could not comprehend the different kinds of yeast. My first batch turned out with the consistency of bagels. -For the last few weeks, I've been getting what I thought were spider bites. Well, turns out they aren't spider bites, but it is still a mystery as to what they are... my best guess is anxiety hives? -The weather. I have always lived in a place where the weather is a little unpredictable, but this is just getting ridiculous. One day it will be in the 70s and sunny, and the next day it is raining and in the 40s. This is causing huge problems with people's allergies. -Both the Syracuse Men's AND Women's Basketball teams are still in the tournament. Now, I'm not a huge sports fan, but it is cool to see your hometown teams do so well on a national level. -Even though the weather is being so weird, it's spring!! I can't wait to sit on our beach for the last couple of times. -This might seem stupid to some, but I have been really on top of housework lately. This is something that I've had to grow into a little bit, as even though I am very organized, I really don't enjoy cleaning very much. But I'm proud to say that our house has been clean enough for guests for about a month! -We are getting so excited for our move to Pittsburgh! Looking at apartments is my favorite. We are finally going to upgrade to a 2 bedroom! -I'm almost out of a few key makeup staples, and I am starting to do my research on what I want to replace them with. One is foundation, and I can't wait to try out some of the new stuff coming out of the drugstore. Now, link-up your awkward and awesome things from this month! There really aren't any rules to this link-up, but I'd love if you either put the button in your post, or link back. Thanks, friends!